Which Is Better for Your Retirement Plan? Explore the differences between a 401(k) and Roth 401(k). Most companies no longer offer new employees a pension plan which used to be the standard retirement program. Today, companies typically provide employer sponsored retirement plans often with some kind of employer match in the form of a 401(k) and its close cousin, the Roth 401(k). While the two plans similarly help you save for retirement, deciding between the traditional 401(k) or the Roth 401(k) means choosing between two different approaches to your taxes so it’s important to understand what makes them different. What’s more, a clear understanding of how the two plans differ can allow you to use them in tandem, where possible, to help you tax proof your portfolio and make retirement planning that much easier. Roth 401(k) vs. 401(k): What Are the Differences? The two types of 401(k) plans are essentially the same except for when you pay taxes on your retirement savings. A traditional 401(k) uses pretax wages for its contributions, but withdrawals are taxed like normal income. A Roth 401(k), on the other hand, uses money that you’ve paid taxes on for the contributions so your withdrawals in retirement aren’t taxed. Contribution: A traditional 401(k) takes pretax contributions, meaning the money that you deduct from your paycheck goes directly into your retirement account without having any taxes withheld. Withdrawal: When you withdraw money from a traditional 401(k), that money becomes taxable income. Additionally, if you make a withdrawal before age 59 1/2 – unless it’s for a qualified distribution – you’ll owe a 10 percent penalty plus normal income taxes. Required minimum distribution: You must take a required minimum distribution (RMD) each year from your 401(k) or pay a steep tax penalty beginning when you turn 70 1/2. Contribution: You contribute to a Roth 401(k) with after tax dollars, so the contributions come out of your net pay after taxes have been taken out. 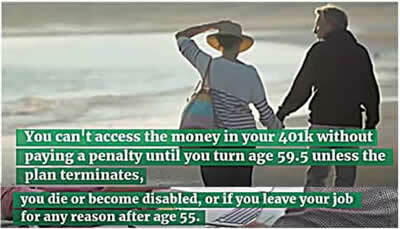 Withdrawal: You’ll owe a tax penalty on money you pull out before the age of 59 1/2. However, you don’t owe any taxes upon withdrawal. Because you used the after tax income for your contributions, the money is allowed to grow tax free. 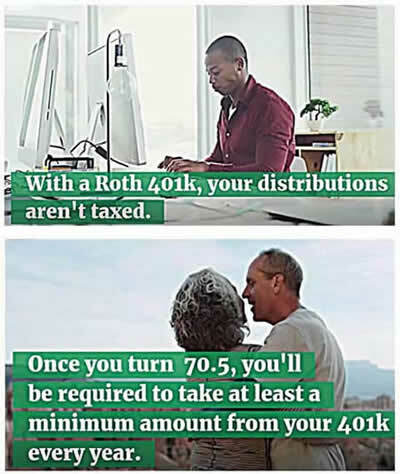 Required minimum distribution: Starting at age 70 1/2, you have to take a required minimum distribution each year from your Roth 401(k). Otherwise, you’ll get slapped with a hefty tax penalty. If you do have to choose between a Roth 401(k) and a traditional 401(k), your personal financial situation, including your income and other retirement accounts, will usually determine the appropriate choice for you. For high earners, and their higher tax rates, the ability to reduce taxable income by contributing to a 401(k) can help save a lot of money. You’re essentially putting off your tax payments until retirement when your income might not be as high and you can stay in a lower tax bracket. It’s also important to think about the other retirement accounts you might have. If you already have a Roth IRA with significant savings, a traditional 401(k) will most likely be a better fit for you. After you reach 59 1/2, you’ll be able to limit your taxable income by strategically switching between those accounts to cover expenses. Roth 401(k) plans tend to make more sense for younger people and low income earners. When you’re earning less, the benefits of avoiding taxes on your income are reduced because your current tax rate is lower. If you already have a traditional IRA or a traditional 401(k) from a previous job, you might benefit from building up savings in a Roth account to create additional tax savings in retirement. So, the basic principle is clear. Regarding taxes on your 401(k) or Roth 401(k) account, it’s pay now or pay later and there are solid reasons supporting either option. But if you can anticipate falling under a lower tax rate later in life, it makes a lot of sense to pay down the line. However, it’s not an all or nothing decision when it comes to Roth vs. traditional 401(k) plans. Contributing to both is ideal. Balancing contributions to both accounts can mean having flexibility in your retirement income, especially once you include your Social Security benefits, to help keep your taxable income low. Regardless, whichever 401(k) plan you choose for your investments, both are important tools in preparing for retirement, and the best plan is to contribute as much as you can now. Barri Segal and Joel Anderson contributed to the reporting for this article. GOBankingRates is a personal finance resource designed to make learning about money and managing your finances more fun and less intimidating. With a focus on how money intersects with your personal goals, travel, politics, celebrity, food and events, we create articles and videos to educate, engage and entertain. © 2019 TLC Magazine Online, Inc.